It’s no secret that you love your 4-legged furry friend, but truth be told, getting rid of the dog smell in your home is something that most people want to do. If you could have your home smelling fresh and clean, wouldn’t you? Use a combination of hydrogen peroxide, white vinegar, and washing soda to remove pet smells from blankets. Add the ingredients in addition to your laundry detergent for a boost of extra cleaning and deodorizing power. If you have a large dog, you don’t want to have to bathe him every time he gets a little stinky. Use homemade dry dog shampoo between washings to minimize odors. Your dog will smell fresh as a daisy (or as fresh as rosemary and mint, anyway) with this homemade dog spray. My personal favorite is this minty vanilla dog spray. Put some in a travel-sized bottle to take with you everywhere. And if you have dogs and carpets, odds are that your vacuum stinks every time you turn it on. It really helps to throw the filter in the washing machine (on the gentle cycle), wash all the parts of the canister, and let everything dry in the sun. Try adding a dryer sheet to the canister to help with odors, too. And how about those stinky carpets? This two-ingredient powder can get rid of even the worst doggy odors. Even more great tips about getting rid of the dog smell! Make DIY dog wipes with all-natural ingredients (vinegar, water, baking soda and essential oils). Use them to quickly wipe your dog down anytime he gets into something smelly or just starts to have that dog odor. What can you do when the dog smell seems to permeate the whole house? Try simmering white vinegar on the stove top for a while. After you’ve simmered it, turn off the heat and let it sit. After a few hours, any strong odors should be eliminated. If dog hair is stuck in your carpet fibers, you’ll have a difficult time removing all the dog smell. Use a carpet rake to remove even the toughest stuck hairs. The carpet rake is more effective if you spritz each section of the carpet with water before raking the carpet fibers. To ease bathtime anxiety and have a great smelling dog, use this doggie salt scrub. It’s non-toxic and kills fleas to boot! When you live in the country as I do, it’s inevitable that your dog will get sprayed by a skunk. 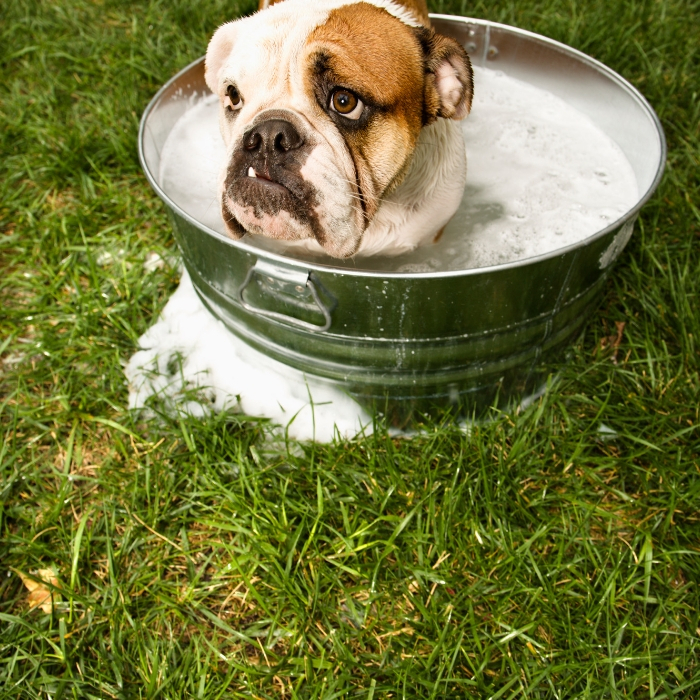 Try this natural odor killer when bathing your dog to get him de-skunked once and for all. See? 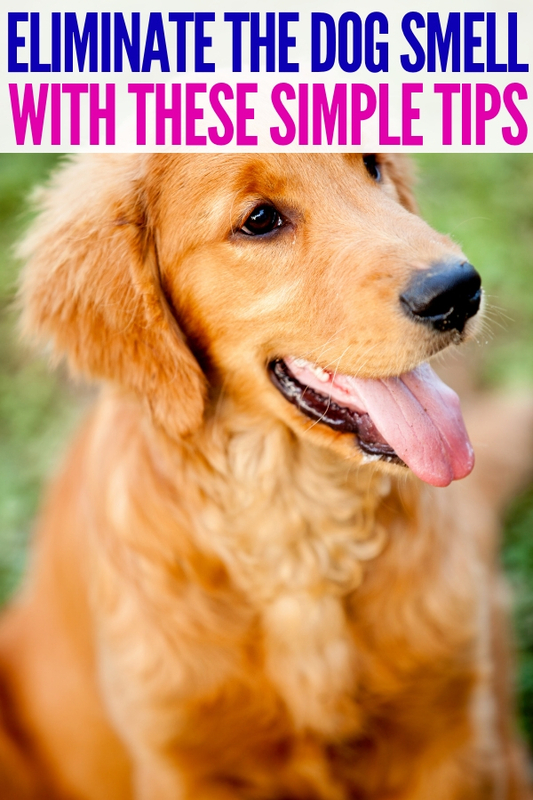 Getting rid of the dog smell has never been easier than with these simple tips! 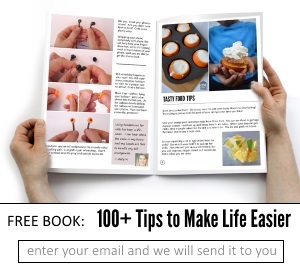 You’ll have a fresh smelling home in no time at all! Do you have any tricks for getting rid of the dog smell?